Her name was Svetlana. She spoke with a thick Slavic accent and wore a pantsuit, which for some reason made me think that she looked like a banker. A Russian banker. Which didn't predispose me to telling her my secrets, but still: I had promised myself that I would do this, that I would seek help, and this place, this tidy office with a worn leatherette sofa and wilting fern and shelves upon shelves of books on psychiatry and therapy and parenting, was where I had arrived. This woman, the occupant of this office, would help me. So, she says, peering at the file in her hands, you vant harm your child? Is chicken scratch. I cannot to read. You look, tell me vat it say. She hands me the file with my psychiatric referral. Um... I squint at the inky scrawl "...reports intrusive thoughts of harming baby... reports wanting to drop baby on bed, escape home, reports experiencing feelings as violent, aggressive... denies intent to harm... denies intent to harm self... denies suicidal ideation... reports being afraid of intrusive thoughts." I cringe. I'd rather not be reading this. "Sleep deprivation. Previous treatment for anxiety. Supportive husband." I hand the file back to her. I didn't say that I felt violent. I said that the feeling itself was violent. Like a shock. It frightened me. Is frightening, yes, these thoughts. She looks me in the eye. I know you do not vant harm baby. 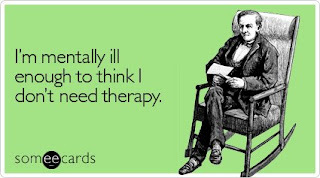 Which is as good a basis for a therapeutic relationship as any, I suppose. I could, I decided in that instant, overlook the pantsuit. I could work with this woman. We spoke at length, Svetlana and I. Or rather, she spoke, and asked the occasional question, which suited me. I hate psychiatric therapy, I hate feeling that I'm being analyzed. I hate listening to the sound of my own voice droning on and on about can't sleep motherhood hard feel anxious yes family history of depression no not suicidal just TIRED TIRED OH SO TIRED. I just want a solution. I just wanted her to give me a solution. And Svetlana was all about the solutions. First, we get you to sleep, no? I give you Ativan; you sleep when baby sleep. Zen, we test blood: thyroid, B12, glucose... your body, I zink, it is PFFT!... zen we meet again; we talk... is good to talk... zen maybe, maybe I give you somezing for depression. Not now. Now, you are tired. You are post-traumatic stress. You need sleep and peas. She leans forward and grabs my hand. Sleep and peas. Yes, I say, finally. Peace would be nice. Peas is nice, she says. I help you to get peas. She drops her voice to a whisper. I tell you somezing. You are not bad mother. You are good mother. She pats my hand. Not to forget. No, I say. Not to forget. Thank you. Peas is good. Today, I will fill the prescription for Ativan and will go to bed early with that little bottle of peas while the husband takes the baby and leaves me in the sweet, sweet quiet dark. With my peas. With my peace. So that I will rest, so that tomorrow will dawn brighter, so that I'll move a step or two closer to feeling like the good mother that I know I am. Note to you all, who do so much to sustain me: if you have e-mailed me in the last month or so and have not had a response from me, please forgive - I am completely overwhelmed and doing the best I can. I read everything. I respond as best I can, but that hasn't been enough to keep control of my inbox. Please know that I so appreciate the support and the contact. I really, really do. So I goes to the doctor and the doctor sez: oh, hai, you has intrusive thotts? you can has psychiatrist! My appointment is at 3:30 today. I am dreading it. I hate talking about my state of mind. HATE. But I will do it, because I must. Hold my hand in spirit, plz? Kthnx. I've stopped keeping track of the time at night, even though a clock sits, ticking relentlessly, not three feet from the bed. In the day, I mark the time obsessively - this many minutes before the girl goes to preschool, this many minutes before she comes home, this many minutes until the boy should be ready to try another nap, this many minutes before he'll probably wake up, the minutes counted like a miser's pennies, added and subtracted, piling up and disappearing as I settle my accounts with daily chores and this persistent exhaustion. But at night, I avoid the clock, afraid to see the minutes and hours ticking by too quickly or too slowly, afraid to settle my accounts with my body, with the night. Last night, however, the bill came due, and I was not prepared to settle up. It was in one of those moments where the boundary between sleep and wakefulness is so blurred that you're not sure whether you're awake or dreaming - are you lucid while dreaming, or are you dreaming while awake? - is that a baby that you're holding, or a kitten, or a bundle of straw? - is that crying you hear, or the wind, or music? - and I was groggy, confused, disoriented as I held my squirming baby in my arms. He fussed, breathing heavily through a stuffy nose, truffling for the breast and then pushing it away. He squirmed and kicked and protested and snuffled and grabbed and pushed and with every kick, every push of his fierce little legs and arms I struggled toward wakefulness, needing to be awake, needing my strength and my composure but wanting oh so badly to just let the darkness overtake me and to slide back into oblivion. But he wouldn't let me, he was too uncomfortable, poor thing, hungry and snuffly and demanding, he would not let me let me go and he would not let this be easy and in a flash, in one moment, I felt the frustration course through me like a current and there it was, for a split-second - a split-second and an eternity all at once - ANGER - sharp and hot and as I felt the tears prick my eyes and a sob burble in my throat I was overwhelmed by the brief flash of an urge to just drop the baby, just drop him to the mattress and throw myself off the bed and stomp away into the night. It was over almost as quickly as it had begun; the violence of the emotion woke me, woke me completely, and I froze - there's no other word for it - with fear and I'm certain that if anyone had been watching at that moment they would have seen my eyes flash open, wide, and I caught myself, mid-breakdown, and stopped. I laid him down and pulled myself into the corner of the bed and took a breath. And was afraid. It was just one moment, the briefest flash of a moment, but there it was. I had felt anger. I had wanted to shove my baby away from me. How close was I to wanting to shake him? How close? How close was I to becoming a monster, to crossing over from Mama Jekyll to Mother/Monster Hyde? I want to say that I was fine, that I am fine, that it was a completely understandable loss of emotional control that only lasted for a second and that I never, ever, would have actually just dropped him onto the mattress (and even then, such a soft mattress, so innocuous a fall, right? right?) and I hadn't wanted to actually shake him, I hadn't been angry at him, I was just tired, too tired, and it could happen to anyone and nothing would have happened and I'm fine. But the fact is that no matter how brief that flash of uncontrolled emotion, it was uncontrolled; it was sharp and hot and angry and I no more want to risk exposing my baby, my little heart, to that anger than I would want to place his bassinet on a train track. Not even for a second. So tomorrow we go to the doctor. Tomorrow I get some help. Pills, talk, anything: whatever it takes. I need some help with this, with the sleep, with the emotions running amok. Tomorrow I get some help. WestJet - as you know if you saw the addendum to my last post - finally had something to say about the flurry of letters (including one from me) and posts concerning their policies on in-flight nursing after I was asked to cover up on one of their flights a few weeks ago, and damn if they didn't manage to just make things just a little bit worse. They did state - in direct contradiction to their first replies to some of you - that their policy is to never interfere with a nursing mother, and to not ask women to cover-up. Which: good. But they insisted upon prefacing that statement with a few pissy remarks concerning the blogosphere's persistence in bitching about this matter which - according to them - occurred this past July and for which they've already apologized. So, hurray! The WestJet Owner Responsible For Placating All Those Stupid Complainers didn't bother to read any of the letters or the posts or MY LETTER or MY POST addressing the incident involving ME in September - she just glanced at the screen and saw the word BREAST and assumed that it had something to do with something else from some other time - and decided to disregard. Which: awesome.